This elegant dish is one of the easiest cooking with wine recipes. It comes to you from Italy, where pasta reigns. It is one of my favorites. Elegant enough for company, but also a breeze to prepare when you are rushed for time. The ingredients can be kept in your pantry until you need them. The wine can be any of the many types of white wine. Salt & Pepper	To taste Bring a large saucepan of salted water to a boil. Add linguine and cook until "al dente". In the mean time, in a skillet pour 1/4 cup oil, add garlic and fry until golden. Add the liquid from the clams and the wine. Reduce the liquid to about 1/2 cup. When linguine is done, drain it and place it in a serving dish. Toss with the rest of the oil and the garlic/clam/wine liquid. Scatter the clams on top of the pasta, and sprinkle with chopped Italian parsley. 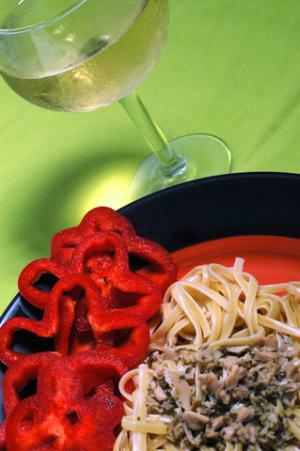 Serve with sliced red peppers or green salad, sourdough bread, and your favorite Chardonnay. This dish is sure to please your family and friends, and the wine in the recipe will make it extra special.